All Web addresses mentioned were functional as of 8-6-15. From the Cumberland Gap to the Atlantic Ocean, this is Virginia Water Radio for the week of August 10, 2015. This week, we feature two mystery sounds, and a guest voice, about two striking birds—striking in looks, and striking in how they hunt. Have a listen for about 30 seconds, and see if you can guess these two long-necked, long-legged wading birds. If you guessed, egret or heron, you’re right! The first call was from a Great Egret and the second from a Great Blue Heron. The guest voice was Alyson Quinn, reading part of her “Lesson from an Egret,” inspired by a September 2007 visit to the Potomac River. The word “egret” derives from an old German word for “heron,” a fitting origin for the many similarities between these two big birds. The Great Egret and the Great Blue Heron are the two largest of 12 North American species of herons, egrets, and bitterns. 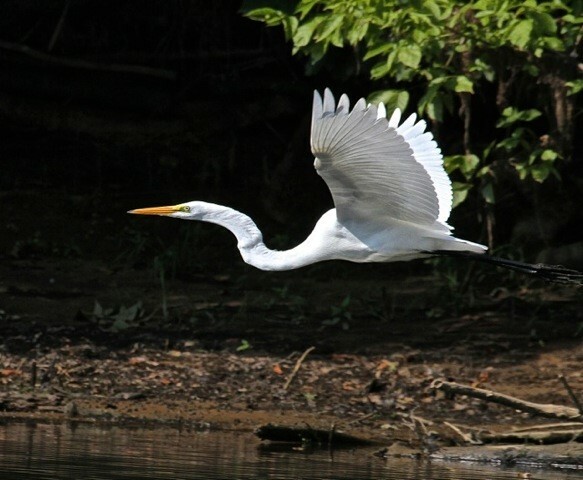 The Great Egret is strikingly white, while the Great Blue has only a partially white head over a bluish-gray body. But a white “morph” of the Great Blue, called the Great White Heron, occurs in Florida. 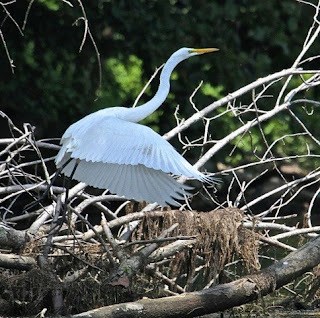 Great Egrets and Great Blues sometimes hunt on dry land, but both typically feed in shallow water, taking fish, amphibians, and other prey by waiting and watching quietly, then quickly striking with their long, sharp beaks. The two species also share a history of having been widely hunted for their long plumes in the late 19th and early 20th centuries; the impact on their populations helped lead to nationwide bird-conservation efforts and organizations. The sounds of the Great Egret and the Great Blue Heron were taken from the Stokes Field Guide to Bird Songs-Eastern Region CD set, by Lang Elliott with Donald and Lillian Stokes (Time Warner Audio Books, copyright 1997), used with permission of Lang Elliott, whose work is available online at http://www.langelliott.com/ and the “Music of Nature” Web site, http://www.musicofnature.org/. Excerpts of “Lesson from an Egret” are courtesy of Alyson Quinn, from her blog “Winterpast” (9/21/07), available online at http://www.winterispast.blogspot.com/, used with permission. Ms. Quinn made the recording after a visit to Algonkian Regional Park, located in Sterling, Va. (Loudoun County), part of the Northern Virginia Regional Park Authority. More information about the park is available online at https://www.nvrpa.org/park/algonkian/. Top two: Great Egret along the New River near Parrott, Va. (Pulaski County); by Robert Abraham, used with permission. 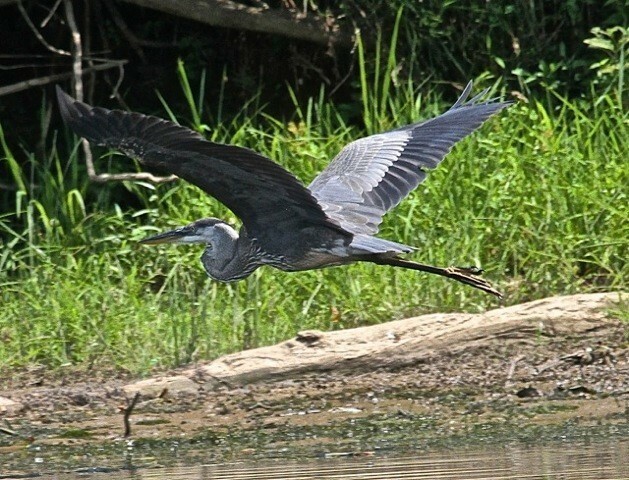 Third: Great Blue Heron along the New River near Parrott, Va. (Pulaski County); by Robert Abraham, used with permission. 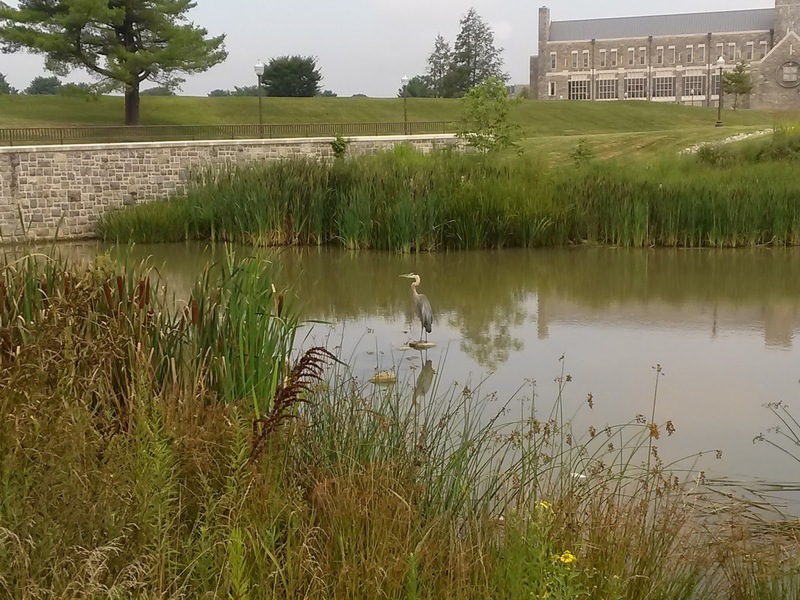 Bottom: Great Blue Heron in stormwater pond on Virginia Tech campus, Blacksburg, July 28, 2015; by Alan Raflo. Audubon Society, “History of Audubon and Science-based Bird Conservation,” online at http://www.audubon.org/content/history-audubon-and-waterbird-conservation.Cornell University Lab or Ornithology, “All About Birds,” online at http://www.allaboutbirds.org; and “Birds of North America Online,” online at http://bna.birds.cornell.edu/bna (subscription required for the latter). Oxford Dictionaries/Oxford University Press, “Egret,” online at http://www.oxforddictionaries.com/us/definition/american_english/egret; and “Heron,” online at http://www.oxforddictionaries.com/us/definition/american_english/heron. Chandler S. Robbins et al., A Guide to Field Identification of Birds of North America, St. Martin's Press, New York, 2001. Virginia Department of Game and Inland Fisheries, “Fish and Wildlife Information Service/Species Information,”online at http://vafwis.org/fwis/?Title=VaFWIS+Species+Information. Joel C. Welty, The Life of Birds, W. B. Saunders Company, Philadelphia, 1975. E-bird Web site, maintained by the Cornell Lab and the Audubon Society, online at http://ebird.org/content/ebird/. Here you can find locations of species observations made by contributors, and you can sign up to contribute your own observations. U.S. Fish and Wildlife Service’s National Digital Library, online at http://digitalmedia.fws.gov/cdm/. Images and other products (documents, videos, or audio recordings) of Great Egrets are available at http://digitalmedia.fws.gov/cdm/search/searchterm/Great%20Egret/order/nosort; for Great Blue Herons, at http://digitalmedia.fws.gov/cdm/search/searchterm/Great%20Blue%20Heron/order/nosort. Virginia Society of Ornithology - non-profit organization dedicated to the study, conservation, and enjoyment of birds in the Commonwealth; online at www.virginiabirds.net. Black-crowned Night Heron featured in Episode 235 (10/13/14). Green Heron featured in EP127 – 9/10/12. Green Heron and Snowy Egret in “Last Bird Out,” Episode 183 (10/14/13), on fall migration. 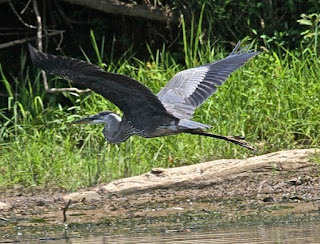 Great Blue Heron in “A Summertime Virginia Sampler of Birds around Water,” Episode 118 (7/9/12). For other episodes on birds in Virginia, please see the “Birds” category at the Index link above (http://www.virginiawaterradio.org/p/index.html). 3.10 – impacts on survival of species.